from my bookshelf: Today's blog entry is brought to you by the letter "E"
Today's blog entry is brought to you by the letter "E"
I started my blog back in a far off time (February to be exact - it doesn't seem possible that I've only been doing this for 6 months!) as a way to keep better track of what I am reading and as an extension of my LibraryThing account. I had been posting some reviews on my general blog, but thought it would be a better idea and easier to condense all my book related entries into one blog. Well, much to my surprise this past weekend, I found out that my good friend Gail has nominated me for a blog award! If you haven't stopped by her blog, you should do so regularly. Her reviews are always well written and honest and she has a great, eclectic taste in books; you never know what she's going to be reading next. I guess it's now my job to nominate seven more great blogs that I read on a regular basis (since Gail nominated me, I can't be nominating her back, but she'd be on this list!). First off is Ann's blog, Table Talk. I have discovered so many wonderful new authors and books through her blog! I know that if Ann reads a book and says it's good, it is. In Gail's words, "Go... read her words... and you'll understand." Next up is The Boston Bibliophile. She always has some new great blog idea to share and she is always reading the most interesting books. My favorite day is Monday, when she reviews a new graphic novel. I've gotten some great ideas to expand my knowledge of graphic novels. A regular stop for me is also Libba Bray's blog. Libba is the author of the The Gemma Doyle Trilogy. It may not be completely book related all the time, but her blog never fails to make me laugh. Another author's blog that I check regularly is James Dashner's The Dashner Dude. James is the author of The 13th Reality series, and he isn't shy about sharing how he got into the book business and the progress of his books. It's a great look into the life and writing habits of a great, new and upcoming author. My journey through reading... always has great reviews and writes her blog as if everyone visiting is an old friend. 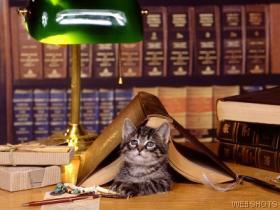 Another fun blog is Musings of a Bookish Kitty. I can always find some insightful reviews there. Last but certainly not least, I'm also nominating Joy's Blog. Again, she always has some great reviews, and hre blog entries are always fun to read. The thing about all these blogs, everyone has such eclectic taste in books, I'm always finding more and more great ideas for books. It's hard to narrow down to just seven because there is such a huge, wonderful network of book bloggers out there. I don't know if I am supposed to be nominating authors either, but I think it's great to see the other side of an author's writing, to see where they come from for their ideas. Thanks again to Gail for the nomination. You're the bestest! THANK YOU! That's very sweet of you. I'm so glad you like my blog. I try hard to make it interesting and fun and I'm so glad you enjoy it! :-) I like yours a lot, as well. I'll do my post in a couple of days. Thanks!! David, thanks so much. Your kind words mean far more because they come from you. As I told someone yesterday, if he wants to comment on my blog he will have to make it clear which David he is because on my blog comments David is my American kindred spirit; the name is already taken. Thanks very much for the kind words and the nomination. As soon as I get a little caught up on reviews, I'll get a post up. I enjoy your blog a lot, too - great reading, and it looks so gorgeous! Wow, thank you! I have been on a bit of a blogging (and reading) break so this was quite a surprise.